Album recorded in two sessions over 1956/7, but not released until 1959, on Prestige’s New Jazz label..
A pair of classic’56/57 bop sessions, four standards, and two McLean compositions, with McLean’s fervent Outburst hinting at what was to come. 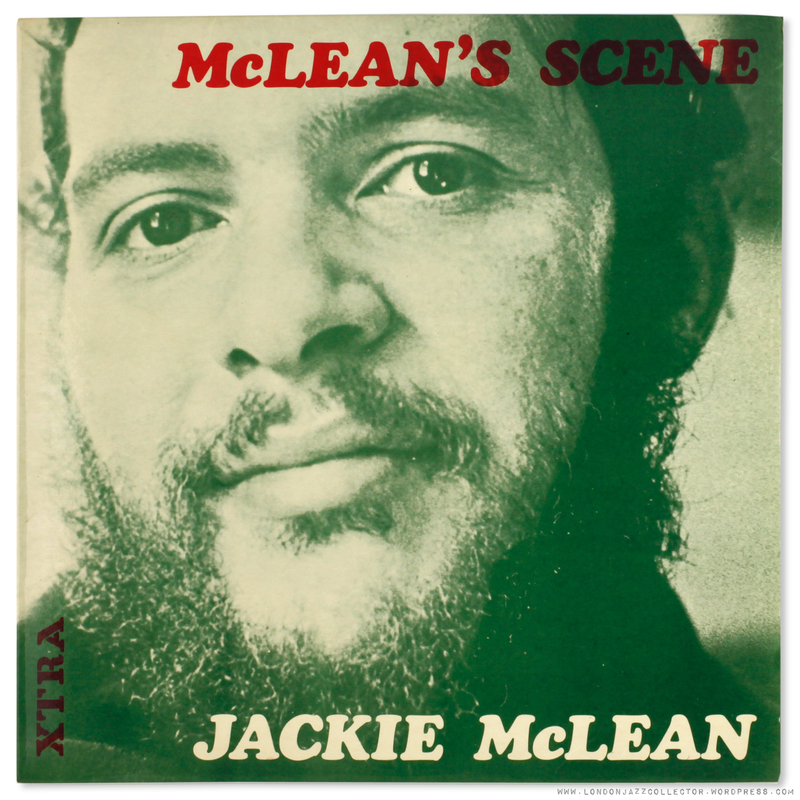 McLean is McLean, but these sessions contrast the keyboard artistry of Mal Waldron on one side with the swinging rhythmic drive of Red Garland on the other. You also get a side helping of Jackie’s Pal Bill Hardman, whose peppery bright trumpet sorties are always a delight. A buoyant Paul Chambers underpins both sides. Straight ahead music, sounding every bit as bright and punchy as an “original” should. 32-141 is a fairly rare Esquire, which I have seen previously only twice, and lost bids both times. This time it was mine. 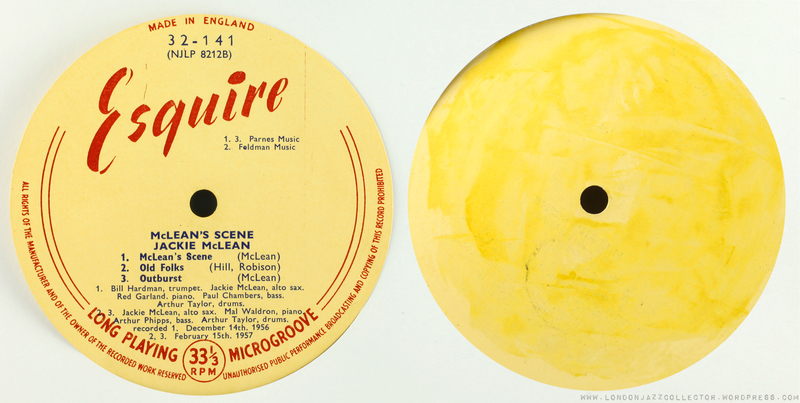 Always happy to add a UK Esquire pressed from the same metal as the original New Jazz. For once, Esquire have pulled off a great cover, credited to one John Marshall. Any Reid Miles influence? Typography strong. In addition to the RVG stamp, (no Abbey Mfg “AB” present), two other stamps in the run-out caught my eye, an “EX” and a “mystic cross”, each on one side only. Both have been seen before on US metal but their identity eludes me. As we have established Van Gelder mastering, I guess they have to do with metalware and plating companies (like the Impulse LW – Longwear Plating Company ) . Anyone any ideas? There is another element of intrigue with this Esquire. 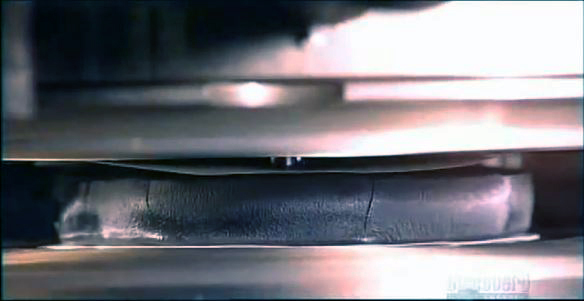 Normally a record’s label is bonded onto the vinyl at the time of pressing. Not so with this Esquire, which was pressed with dummy blank labels, (revealed on side B below) and the Esquire labels attached with adhesive at a later date. We only know this because after over fifty years the side B label adhesive came unstuck. British budget adhesive. Detatched Esquire side B label shown below, front, and adhesive-spread back . Its like NCIS around here, Crime Scene, Do Not Cross. Perhaps this explains why some Esquire labels have been observed with air-bubbles beneath their surface – indicating they too were pressed first with dummy labels and final printed labels attached at a different time. With a pressing run of may be a few thousand, this looks like a job for the assistant sound engineer. Decision made not to stick the label back on. Every record tells a story, no digital media does. It is the genuine artefact without a label. I have had a reissue of this recording for ages, on the British Extra label (left), mid-Sixties successor to Esquire for release of Prestige recordings in the UK. 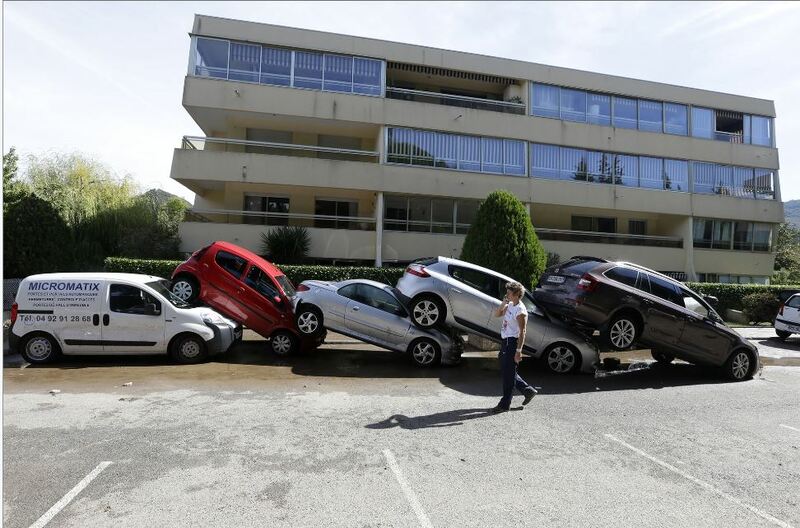 A/B comparison was an eye-opener – the Extra is feeble in comparison to the Esquire, limp and stodgy, no contest. That may be useful to know, as Extra reissues appear to be ’60s vintage, but are lesser in quality. Esquire seem to be getting harder to come by. I blame myself for broadcasting their virtues. A very rare Esquire, Mobley’s Message , turned up in a British Ebay auction recently. Throwing caution to the winds I punched in what I considered an XXL bid, only to find myself placed fourth in the final bidding hierarchy. Annoyingly, bidders identities were protected, an irritating option on Ebay, so I am denied the opportunity to take stock of my opponents. I like to know if I was beaten by a commercial dealer (score 3,000+) or a naïve newbie (score 3), or a battle-hardened collector like myself (3-500) which I don’t mind, fair game. In these losing situations, I often find myself second-placed price-setter, but rarely fourth. That means I was way off the pace. This takes one to a philosophical place: What is a record worth to you? Another thing I came across this week was a very long but interesting lecture by Michael Fremer of Analog Planet (I understand he is something of a controversial figure – Comments Policy! ), the “mysteries of the deadwax“. No mystery to any regular at LJC, but I learned a thing or two. Like vinyl pressing machines operated at their optimum around the middle of the day. Who knew? He talks etchings and stamps, and also does A/B comparisons live between two apparently “original pressings”, where one sounds significantly better than the other. At least I’m not the only one at this game. 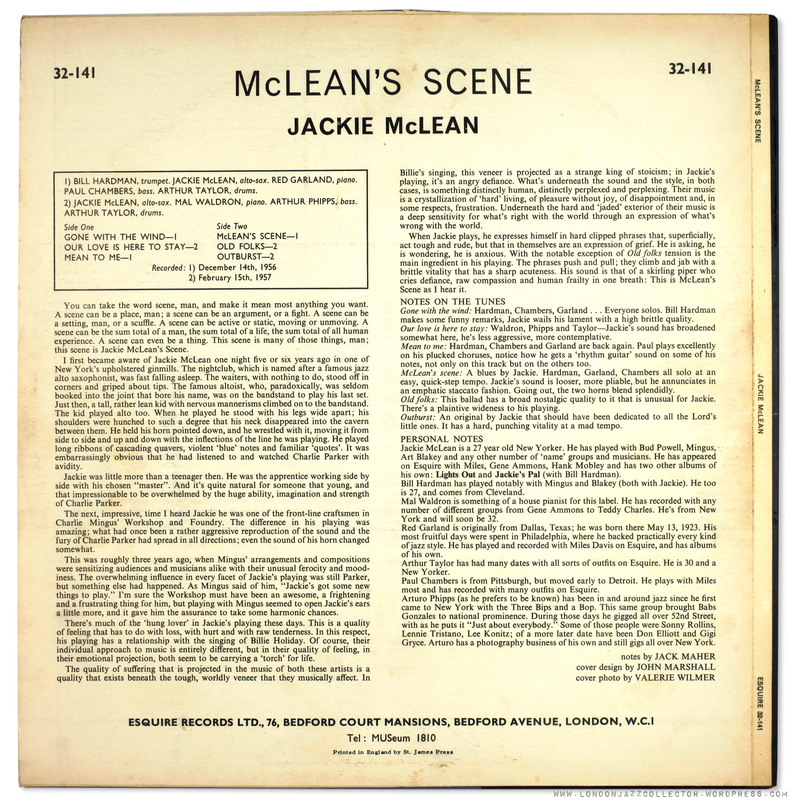 This entry was posted in Esquire, Jackie McLean, New Jazz and tagged Art Taylor, Arthur Phipps, Bill Hardman, deadwax, Esquire, Jackie McLean, Mal Waldron, Paul Chambers, Prestige New Jazz, Red Garland by LondonJazzCollector. Bookmark the permalink. My Blue trident mono doesn’t have any other etching in the deadwax. It has a RVG stamp only. Interesting. Thanks for featuring this McLean. I have seen copies before, but always over looked it. Prices are high for an original New Jazz 1958 copy in fairly good condition. But, the search is on. my # 8212 does not have the cross and EX in the deadwax. Strange enough, on both the A and B sides, the letters A and B are stamped in. So side A has A and B, side B too. This has got nothing to do with the side of the record, since this was etched-in by Rudy behind the catalogue number. Great find by the way, congrats. The art work of 8212 is not credited to somebody, but looks very much to be from the hand Esmond Edwards. Wonderful bit of jazz history. Thank you! 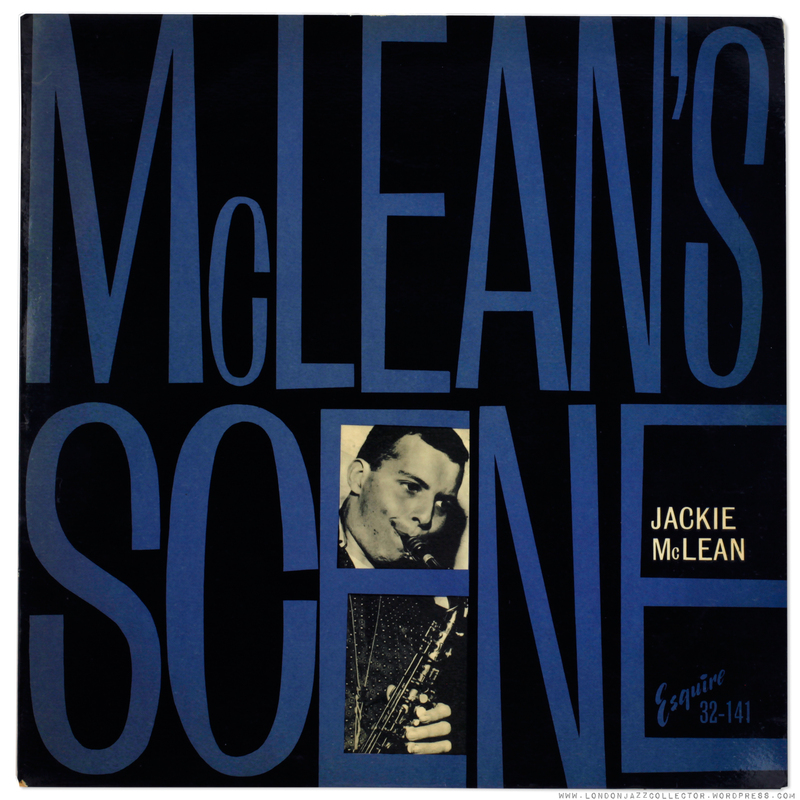 Would still like to know if the Jackie McLean quintet photo is available in a poster form? Thanks again. Hi, not to get too technical but its a small digital composite Photoshop file optimised for web at 72dpi. It doesn’t have the resolution needed for enlargement and printing poster size, so sorry, not possible.